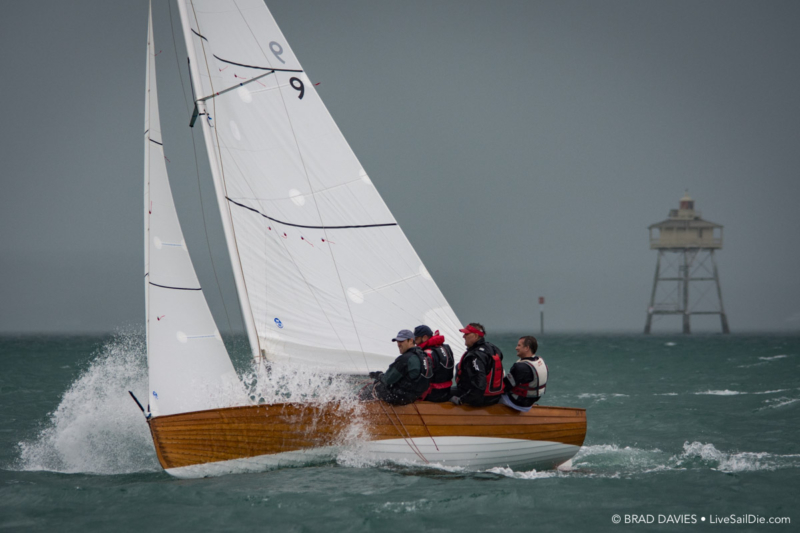 Blustery squalls and heavy rain was on the menu for the 78th Arch Logan Memorial for the classic M-Class yachts and that’s exactly what the fleet was served up at the time the warning signal was meant to be fired. Instead, the AP was flown to ensure the fleet could bunker down and take shelter while a 30 knot westerly swept across the start area. After a few minutes of washing machine weather, the five minute warning was sounded and the fleet went through the traditional M-Class pre-start procedure. All four boats were on the line and it was called a clear start by the race officer. Menace (Howard Spencer, Nick the Pom, Al Gair and Dave Ridley) took an early lead followed closely by Matara (Suellen Davies, Cameron Thorpe, Peron Pearse and Lanny Walker) and Marksman (Jon Andrews, Tom Kearney, Anatole Masfen and Matt Kelway) with Mach One (Nick Hanson, Alex Lowry, James Fleet and Bex Hornell) hot on their transoms. Matara was getting gassed by Menace so opted to tack out onto port to gain clear air sending them into the middle of the course. Menace, Marksman and Mach One continued up the left hand side of the course but it didn’t take too long for Matara to tack back to rejoin the fleet. “No use being corner banging hero’s this early in the game,” said Matara mainsheet trimmer Cameron Thorpe. 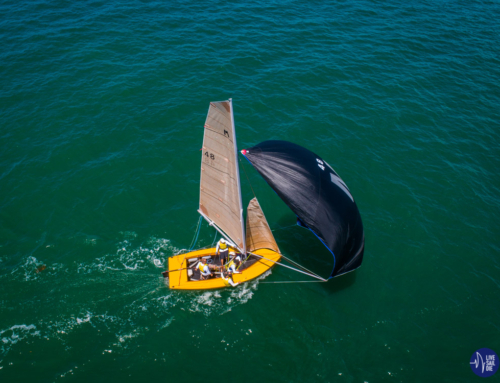 But going to the middle of the course paid off for Matara who gained enough boat lengths on Marksman forcing them to tack off when they met during a port/starboard. Meanwhile, Menace was staying clear of any match racing and maintained her lead. Marksman tacked, and Matara dumped on top. At this stage, the crew of Marksman began yelling out the skippers name “Suellen, Suellen, Suellen” in what was assumed to be an attempt to throw the skipper off her game. 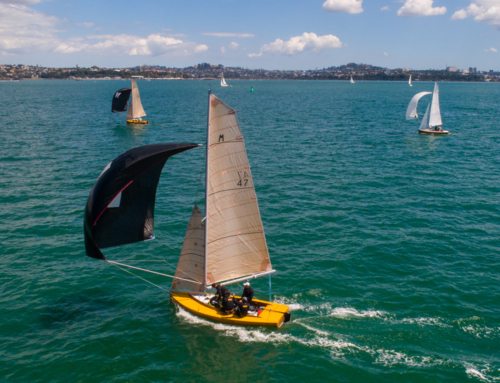 “We decided that Marksman was just trying to distract me so they could try and get an upper hand, but they just kept crying out so we looked around to see why they were being so annoying,” said Matara skipper, Suellen Davies. “Turns out they were trying to tell us that our starboard spreader had broken. Game over for Matara and were hadn’t even reached the top mark!” continued Davies. At this point the Matara crew dropped their main, tidied up the boat, and opened the chilly-bin for a commiseration beverage. By this stage Menace had rounded the top mark and were sending it on the first reach. A massive puff over 25 knots hit them as they flew with the big shoot, absolutely sending it. Marksman almost saw themselves going for a swim, but just moments away from catastrophe, they managed to save it and boosted down to the turning mark. Mach One opted to play it safe and decided against the deploy. At this point the fleet was meant to race to the Bastion harbour mark, and although laminated copies for the course sheet were provided to all boats, unfortunately for Menace they raced to the incorrect mark, putting an end to their dominating lead over the fleet. During post race discussions, the crew of Menace were nominated for the “Ray Davies Navigators Award”, as this wasn’t the first time this season that they have raced to the incorrect mark. With Marksman now in the lead, all they had to do was hold on and sail a clean race. Lucky for them the blustery squalls diminished and the last few legs of the race were vastly different to the first part of the course. Although they managed to maintain their lead, Menace did catch up, but it wasn’t enough to get them to the front of the pack. 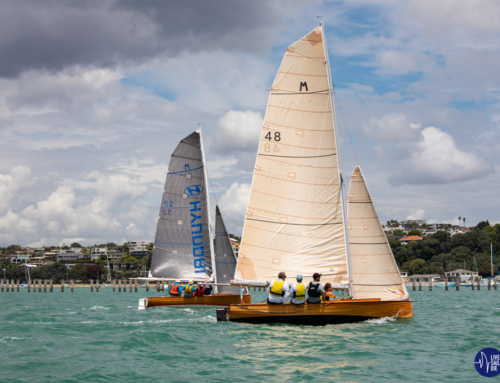 Which means that Marksman were crowned the winners of the 78th Arch Logan Memorial, not only claiming the line honours, but also the handicap win giving them the double victory. “I didn’t expect this when I woke up this morning,” said skipper Jon Andrews. “I’d like to thank the race committee, and of course my crew. But a very special thanks has to go to our coach Dave “Munders” Munday. We couldn’t have done this without him and his ongoing commitment to making us a better team. Thanks so much Munders, this one is for you,” continued Andrews. Marksman. 78th M Class Logan. While Menace did receive the nomination for the Ray Davies Navigators Award, they will have to wait until the official prize giving on Friday 15th June to learn if they have won the not so prestigious award. Meanwhile Matara is licking their wounds, but has vouched to be back to take on the 79th edition of the race.